NVIDIA has published a new set of graphics drivers for all GeForce-based graphics cards. R385.41 adds support and optimizations for Destiny 2 PC Open Beta, PlayerUnknown’s Battlegrounds, ARK: Survival Evolved, F1 2017, Pro Evolution Soccer 2018, and Quake Champions Early Access. Compared to previous R385.28, R385.41 exposes few new OpenGL extensions and a new version of the Vulkan API: Vulkan 1.0.49. 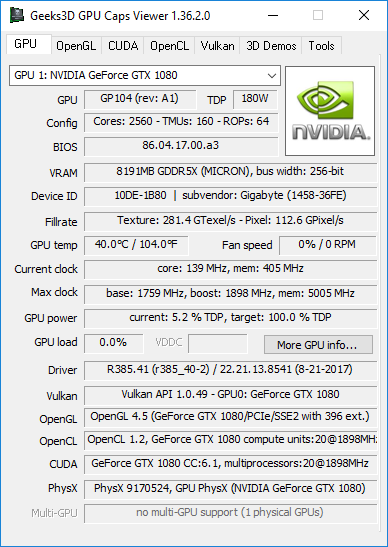 If you need for advanded features, R382.96 exposes OpenGL 4.6 / Vulkan 1.0.58.